Based on a novel by cult Scottish author Christopher Brookmyre, Bedlam takes us on a tour through videogame’s past in first-person, nodding and winking at classics along the way. Enjoy interesting games? Why not check out our list of the 20 best indie games on PC. You play as Heather Quinn, a programmer at a medical company called Neurosphere. Plot happens and an accident sees her warped into the videogame world of Starfire, a Quake-like shooter from the ’90s where cyborgs are trying to erase humanity from existence. Quinn spawns as a grunt in the cyborg army, but events soon see her hopping between other videogame worlds, from World War 2 shooters to fantasy RPGs – and she can take the weapons she finds with her. I’ve always wanted to shoot a fairy with an M1 Carbine. 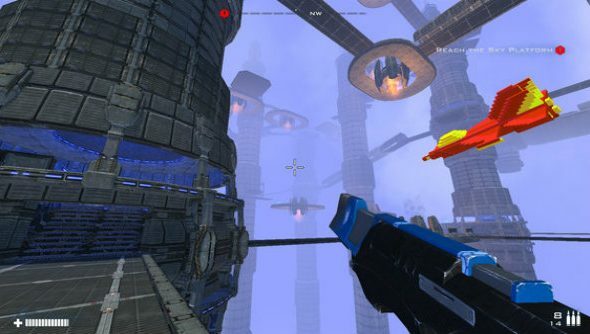 If like me you’ve often wondered what it would be like to stroll through lush, retro fantasy lands while killing everything with a massive, sci-fi rocket launcher, Bedlam has finally launched on Steam.